A pretty copper wire butterfly suncatcher wrapped with blue lace agate and glass beads. Inspired by an early morning summer’s day when dew drops delicately hang on garden leaves, where pretty butterflies dance around as the sun gently rises with the promise of a warm day ahead. Whether for hanging in the home as a beautiful window decoration or hung outside in the garden for year round sparkles of colour and light play, this artisan sun catcher will make a beautiful addition to your home. A decorative copper wire dragonfly hanging decoration adorned with pretty aqua, teal and azure semi-precious gemstone and glass beads. Inspired by the height of summer when dragonflies dance over the water, shimmering with beautiful blue metallic colours. This design uses the British azure damselfly species as my muse. Hang in your lounge window for some lovely sunshine sparkles or out in the garden for year round colour. This pretty circular suncatcher is hand-made with copper wire work, semi-precious gemstones and Czech glass beads. Adorn your home window with this very sparkly decoration that is inspired by water bubbles that shimmer and shine in the air. With a watery colour palette of blue, white, clear and grey, each bead is translucent allowing the sun to shine through. This butterfly window decoration is adorned with a colourful palette of blue, green and pink. Hand-made with oxidised copper wire work and adorned with gemstone beads. Hang in your window to make the most of these translucent beads. For all wildlife lovers and memories of summer time gardens. This pretty hanging decoration is inspired by the English heritage symbol the ‘Tudor Rose’. Handmade with copper wire work and adorned with a soft colour palette of pink and white gemstones and glass. Hang in your window for sparkles of sunshine backlit through the translucent beads. 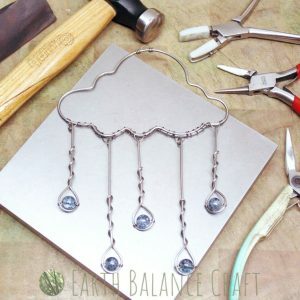 Learn to make this rain cloud hanging decoration using titanium metal wire and sparkly glass beads. This box is the ‘materials only’ version, providing the materials needed to make this pretty suncatcher. This starter kit would suit someone who already owns a set of wire-working tools and equipment and would like to try out a new wire wrapping project. Give the gift of a rainy day project to someone special. A pretty copper wire moth suncatcher with agate and quartz stones. Featuring a soft colour palette of soft and watery leafy greens with warm pink tones in the wings. Inspired by the British ‘Rosy Footman’ moth (Miltochrista miniata), typically found across broad-leaved woodland, heathland and mature hedgerows in the height of summer. This moth’s pinky/orange wings are of visual interest with striking black linear markings. Whether for hanging in the home as a beautiful window decoration or hung outside in the garden for year round sparkles of colour and light play, this artisan suncatcher will make a beautiful addition to your home. 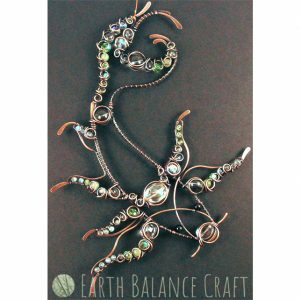 This pretty wire work suncatcher follows the dynamic contours of the koi carp fish. Inspired by the Hairwake koi species, known for its’ yellow and silver/white colourings that appear like a metallic lustre in the water. The design is hand-made with copper wire, that is wrapped around sparkling crystals, gemstones and glass beads. Hang in your window for shimmers of light when the sun shines. Learn to make a pretty rain cloud window decoration from titanium metal wire and sparkly glass beads. This hobby in a box makes the perfect gift idea for those who enjoy learning new crafts. The box contains a wire wrapping starter kit with all of the materials you need to make this kinetic hanging decoration for the home.